Learn all about what makes a complete school meal here! Well balanced and nutritional meals are planned daily. 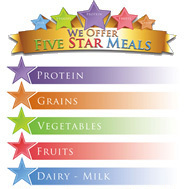 Meal pricing offers students a complete meal with a wide variety of choices to meet the needs of the age groups served. Meals consist of components or units. Entrées consist of 2 components (In general a protein or meat and grain combination). A colorful selection of vegetables and fruits are considered 1 component each, with 2 offered with lunch and 1 with breakfast. Milk is 1 component. The total number of components offered at lunch is 5. A Complete Lunch includes a choice of entrees, a colorful selection of vegetables, fruits, juices, bread or grains, and milk. *Students must choose at least 3 of the 5 components offered with at least one serving of a fruit or vegetable to receive the meal pricing. *If a student takes anything less than 3 components and a fruit or vegetable is not chosen ala carte prices will be charged and this will most likely result in a higher cost to the student. A Complete Breakfast includes a hot or cold breakfast entrée, fruit or juice, and milk. Students must choose a total of 3 of the 4 components offered to receive meal pricing. All food on campus is selected using the highest standards and meet the USDA requirements for school meals. Meals are planned to meet the new standards that include each week an offering of dark green, orange/red, starchy, legumes, and other vegetables. Half of all breads and grains must be whole-grain rich. Larger portions of fruits and vegetables will be offered to students based on the grade level served. All milk is non-fat and if offered in both plain and flavors. Acceptable snack items that are nutritionally approved are available at additional charges.